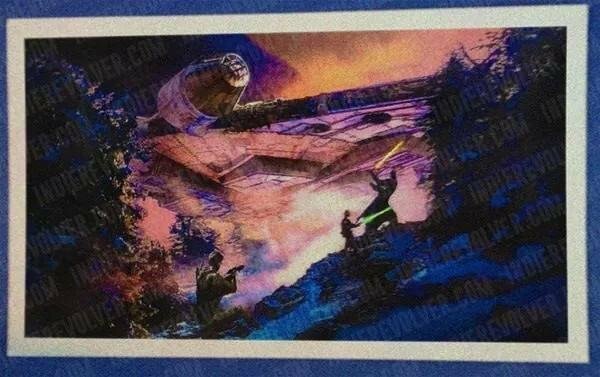 Concept art of Luke Skywalker fighting new villain in front of Millennium Falcon? Jay from Indie Revolver has concept art of Luke Skywalker fighting a new villain in front of Millennium Falcon while someone with a gun tries to help (I think). You can also see the snow and trees we’ve discussed in past reports. It is rather different than Hoth and honestly, at this point, I’m not actually convinced its a “snow planet” at all but rather a planet where it snowed. The rumor is there is an Imperial type base on this planet. But other rumors have connected the tree house sets from Puzzlewood to this location as well. What is interesting is the bad guy in this piece is similar to the cyborg piece that dropped a while ago in a way. Another version of this same type of photo showed the bad guy with an orange (not red) lightsaber. I do believe the saber above is orange too. The size of that guy is particularly interesting to me. The art is really fantastic. Naturally there will be skeptics about leaks, but the work in the piece above is clearly professional. Good luck, Luke Skywalker! You’re gonna need it!